My husband maintains that as we age, gardeners transition through three stages: annuals, perennials, and shrubs. Looking back, I see his point. My twenties were consumed with vegetable gardening and other annuals. In my forties, when three years no longer seemed a long wait for a plant to mature, my passion for perennials peaked. Curiosity led me beyond reliable plants to many that presented challenges. Marginal hardiness, special soil requirements, and other sorts of demands required lots of my gardening time and energy. I prefer to think it’s more a sign of maturity than age, but increasingly I’m drawn to plants that both reward and require less of me. And while I’m not about to banish either perennials or annuals, shrubs are playing more and more prominent roles in my garden. Three of my favorite woody plants far exceed the basic criteria for low-maintenance: needing little attention, no irrigation, and minimal pruning when properly sited. Each of them also offers a long period of interest in addition to other useful characteristics. Perhaps most important for gardeners in our area, all three shrubs are regarded as deer resistant. Bottlebrush Buckeye (Aesculus parviflora) is a Southeastern native with a limited range in the wild. Breathtaking flowers and a tough, adaptable nature are leading to its wide distribution in gardens. Large, palmate leaves provide drama throughout the growing season, while spikes of white flowers nearly two-feet long stop traffic in early summer. Spectacular when seen from a distance, Bottlebrush Buckeyes warrant closer examination for their coral tipped stamens and the multitudes of butterflies and other pollinators drawn to them for nectar. Their mature size (10 x 10 feet) precludes using Bottlebrush Buckeye in very small gardens, but their sun/shade adaptability and drought tolerance once established make them invaluable elsewhere both as specimen shrubs and massed under canopy trees. 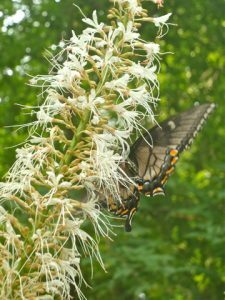 Creating a natural area of Bottlebrush Buckeye under planted with spring and summer bulbs is an excellent low-maintenance choice with year-round interest for those who want to reduce their lawn and mowing chores. 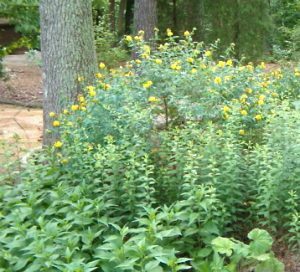 A shrub at home in even the smallest of gardens is Sunburst St. John’s Wort (Hypericum frondosum ‘Sunburst’). Getting its name from the sun-like flowers that adorn the plant in June, ‘Sunburst’ is a selection of Golden St. John’s Wort found in scattered locations across the Southeast. Typically maturing at three to four feet with a rounded habit, ‘Sunburst’ creates a blue-green mound that is a perfectly sized companion and foil for perennials in a mixed border. Adaptable to sunnier locations, it also works well as a mass planting for a dry, light shade area. After a display of bright fall color, ‘Sunburst’ sheds its leaves to reveal coppery exfoliating bark with tiny green spikes that become the next year’s leaves. Very glossy, dark evergreen foliage helps Woodland Ruby Anise (Illicium x ‘Woodland Ruby’) shine throughout the year. When crushed, the leaves give off a spicy scent that combined with star-shaped seedpods to provide the common name anise. The mature size of eight to ten feet makes it an excellent choice for screening or foundation plantings. 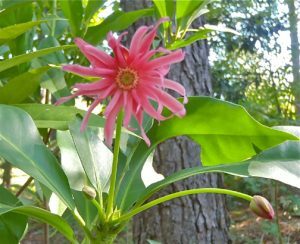 Introduced to horticulture by Raleigh resident Robert Mackintosh, ‘Woodland Ruby’ is a cross between the naturally occurring white form of Florida Anise (Illicium floridanum album) and Illicium mexicanum. Like Florida Anise, it is extremely shade tolerant and usually unappealing to deer. ‘Woodland Ruby’s’ pinwheel-shaped, jewel-toned flowers are more brightly colored than those of Florida Anise. 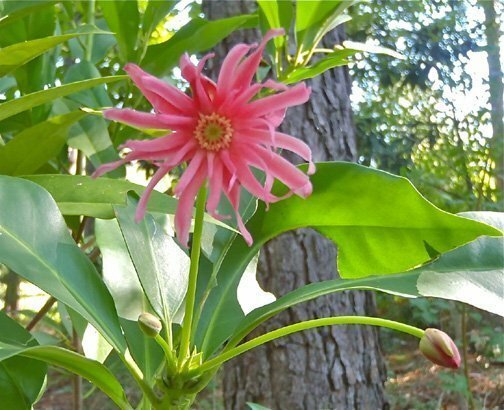 While regular Florida Anise blooms only in spring, ‘Woodland Ruby’ flowers profusely in spring and sporadically throughout the summer and fall. If you want to lessen your labor or simply want more time to enjoy your creation, consider planting one or more of these shrubs no matter which stage of gardening you’re in.